Wow, I remember watching the 1st season of her show, Life in the Fab Lane and I was wondering when the doll would come out. You know you've made it, once you have your own doll! She's simply fabulous and i'm totally hooked on the 2nd season! people can say what they want but she got her own damn barbie I love kimora she is great. how many other great celebrity's have their own barbie lets think about it ......... ummm there that girl who played in nope she don't have her own barbie hmmmm who else ................... nope no one say what you want she got her own barbie you gotta be pretty much on game point to have your own barbie. I was wondering...Is Kimora getting "FAT"? Her face looks all puffed up. Maybe she is eating too much because she does'nt have her husband to boss around anymore and is turning to food. I bet he is happy to be done with the conceited which. Is that how she really acts? I am embarressed for her. well, i agree to T.T's. .oh gosh. . that's_____??? I love Kimora. such a nice collection. very interesting post.keep it up! barbie collections are getting rosier by the day...almost style statement by the Diva and followed by worldwide children. yeah, I think, Kimora Barbie's will be very popular.. I definitely agree with you there. 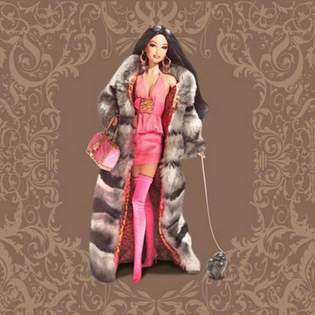 Looks Kimora Barbie's will be very popular because of it's new collection. such a nice style. keep it up! I also actually think this doll is super. Yep, she has really made it now that she has been made into a Barbie doll. such a nice starting blog.. i like ur blog..